Is there a better alternative to AntiRSI? Is AntiRSI really the best app in Health and Fitness category? Will AntiRSI work good on macOS 10.13.4? AntiRSI is a program for OS X that helps prevent RSI (repetitive strain injury) and other computer related stress. It does so by forcing you to take regular breaks, yet without getting in the way. It also detects natural breaks so it won't force too many breaks on you. This is an evolved version from the still free 2.1 version (available in Related Links). AntiRSI can be removed from the Dock and appear in the menu bar. 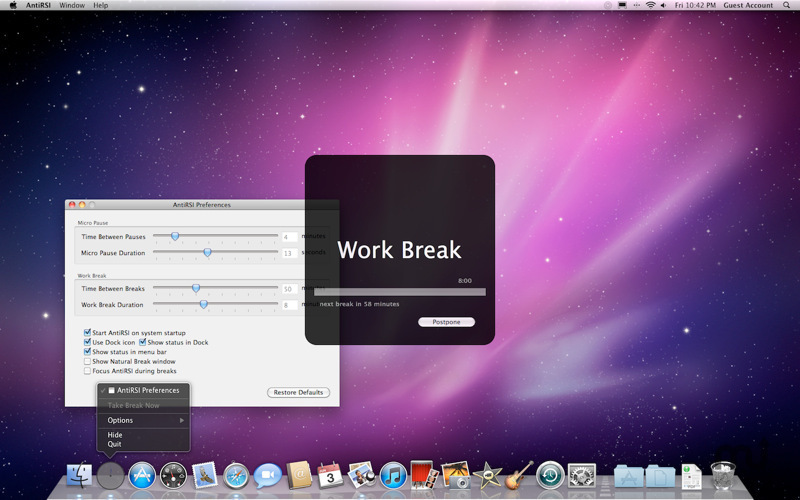 Break windows appear on all connected displays. Larger break window, screens are no longer 17 inch. Ability to disable micro-pause or work breaks. AntiRSI needs a rating. Be the first to rate this app and get the discussion started! Improved compatibility with media players. Please Note: AntiRSI is a reminder tool that can be helpful, but it is not a medical device. If you experience problems, please consult a doctor.